Get up close and interact with a dolphin at Atlantis The Palm in Dubai! Choose between a shallow-water or deep-water experience for a 30-minute interaction with a bottlenose dolphin in a crystal-clear lagoon. Both experiences include free, same-day admission to the Aquaventure Waterpark and 25% off same-day entry to The Lost Chambers Aquarium. 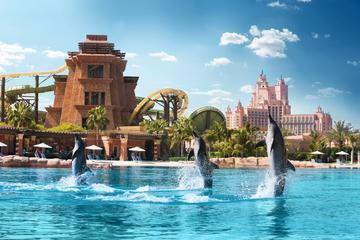 Choose your dolphin experience when you book, and on the day, make your own way to Dolphin Bay at Atlantis The Palm, in Dubai. Made up of three large lagoons, the bay is Dubais first mammal rescue and rehabilitation centre, and focuses on education and conservation, while also hosting interactions with beautiful Pacific bottlenose dolphins. Meet the trainer and, after putting on your provided wetsuit or vest, enjoy a 15-minute introductory session with a complimentary soda or water. Learn about the dolphins, including their behaviours and diet, and then, after a safety briefing, head for the lagoon. Groups are limited to six people per dolphin for the shallow-water experience, and 10 people per dolphin for the deep-water experience, allowing for a personalized experience during the 30 minutes you spend in the water. Both options include same-day access to the Atlantis Aquaventure Waterpark, plus a 25% discount on same-day entry to the hotel's The Lost Chambers Aquarium. With your trainer beside you, enter the the dolphin lagoon and wade into the warm, waist-high waters ready for your encounter. An inquisitive dolphin will swim to you, letting you get close up for a personal interaction. Touch and stroke the dolphin, and then watch as the playful creature shows off its high-energy antics in front of you. No swimming is involved and the entire 30-minute encounter takes place in shallow water. Once in the deeper waters with the trainer, wait as a dolphin swims up to you. Thrill as the marine mammal spins around you in the deep water, moving gracefully around the lagoon. If you wish, take a belly ride on the dolphin as its swooshes through the water.